SEPTEMBER 5. VISIT TO YULBÁ, CUILCO. 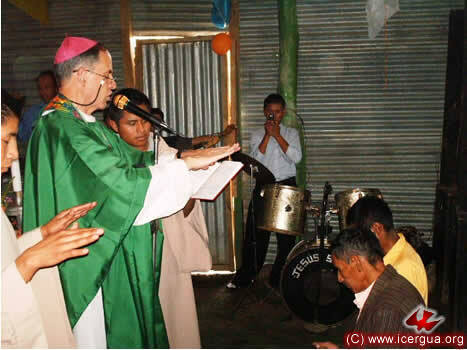 On September 5 our bishop made a pastoral visit to the Community of Yulbá in Cuilco, Huehuetenango. The missionary dynamism of the members of this community is outstanding. Under the leadership of Brother Fausto and Brother Juventino, the Renewed Catholic Church has achieved astonishing growth here. SEPTEMBER 5. FIRST VISIT TO THE COMMUNITY OF INJERTAL, CUILCO, AND ITS ALLIANCE WITH ICERGUA. 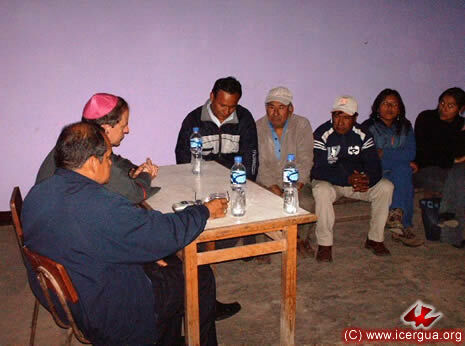 The Community of Injertal el Zapote in Cuilco has just made an alliance with ICERGUA. After many years of searching and of achieving a beautiful ministry in music, they feel that they have finally discovered the space in the church for which the Lord had called them. Those joined together here number more than 150. Above: The ministry of Injertal, singing in the Eucharistic celebration. Right: Prayer during the Eucharist. SEPTEMBER 5. 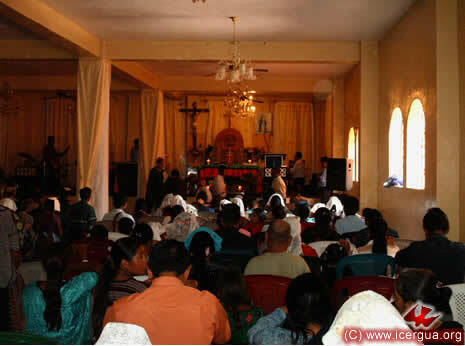 EUCHARIST IN THE CENTER OF CUILCO, HUEHUETENANGO. 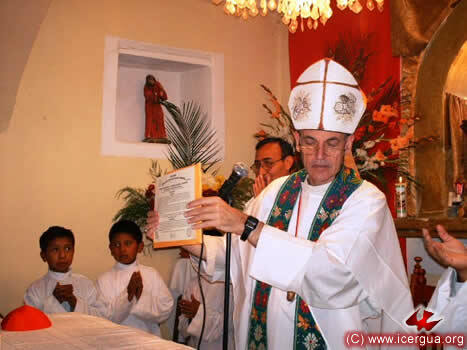 On the same day, the bishop celebrated Eucharist in the See of Central Cuilco. The rapid growth of the community is readily apparent. Baptisms, Confirmations and a marriage were celebrated. The group’s commitment to service and evangelism is bearing abundant fruit. Above: The bishop in the procession, greeting and blessing the participants. Right: The participants during the Eucharist from the side of the tabernacle. Left: The parents of the nuptial couple coming to give their blessing and to admonish them to live out the sacrament of marriage. SEPTEMBER 5. 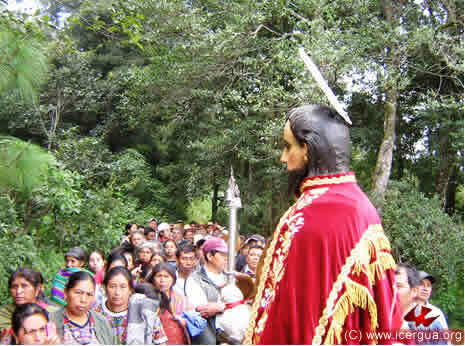 CELEBRATION IN CHINACÁ, HUEHUETENANGO. 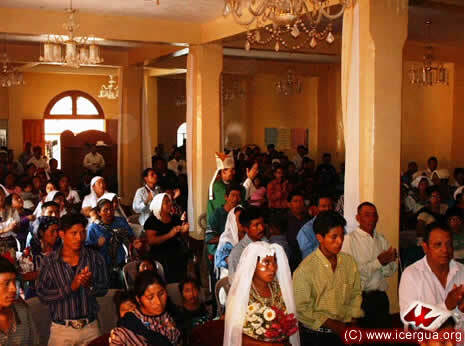 During the evening of September 5 a marriage was celebrated in the Chinacá Church in the presence of a large number of participants. The couple and a good portion those in attendance come from the Community of Buenos Aires, municipality of Huehuetenango. SEPTEMBER 6. 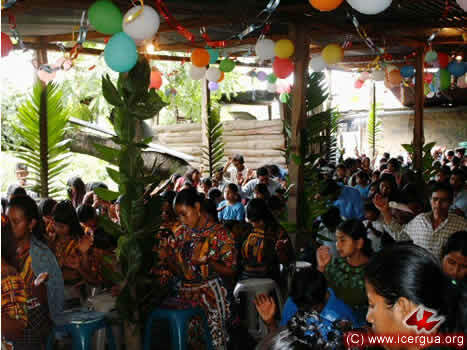 CELEBRATION IN SAN GASPAR IXIL, HUEHUETENANGO. On the morning of September 6, Mons. 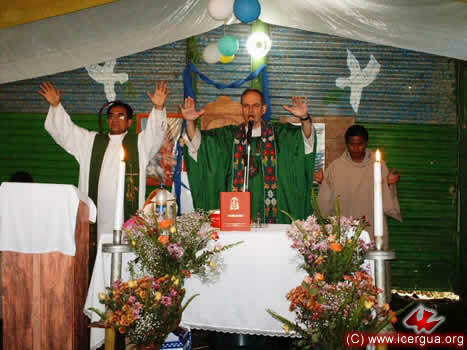 Eduardo presided at Eucharist in the Community of San Gaspar Ixil. The enthusiasm of the faithful is evident. 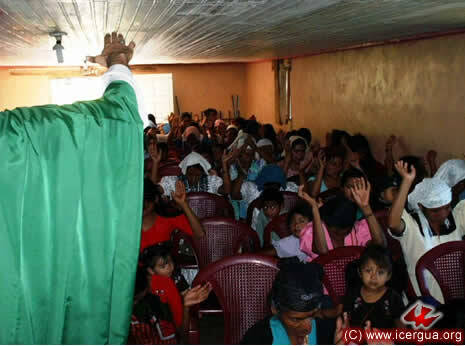 Having begun only a short time ago, the community is determined in its evangelism and has the support of brothers and sisters from La Vega, Colotenango and Buena Vista, San Pedro Necta. SEPTEMBER 8. MEETING OF THE PRESBYTERY OF GUATEMALA. On Tuesday, the eighth, solemnity of the birth of St. Mary, the meeting of the Presbytery whose ministry is located in Guatemala City was held. All the presbyters were present. As stipulated in the Constitution, the meeting was moderated by Father Rigoberto Upún Tum, Vicar General and Dean of the Presbytery. Each of the priests present gave a brief report on the parishes and deaneries in which they work. 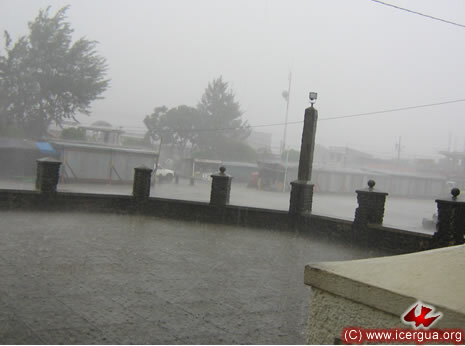 Some practical aspects were planned for the ICERGUA anniversary on October 27 in the education center in Huehuetenango. After lunch, the bishop offered instruction, which went deep into certain aspects of the Renewed Catholic Rite, making everyone aware of what makes it distinctive and how it rediscovers essential elements of sacramentality that have been lost over the course of time or have been neglected in the ritual practices of the Western church. Two points that received special emphasis were the role of the Holy Spirit as the agent of sacramentality and the importance of the participation of all the people of God as the celebrant of the sacraments, presided over by the ordained ministry. SEPTEMBER 10. PRAYER IN SAN JUAN COMALAPA. The lack of rain has wreaked havoc in many of our communities. The communities of the Cathedral of San Juan Comalapa, presided by Fathers Rigoberto and Francisco, decided to hold a day of prayer, penitence, petition and fasting to ask, through the intercession of its patron saint, St. John the Baptist, the Lord to send the rain. The answer was not slow: hardly had they returned to the Cathedral before a torrential outpour began, enabling the plants and fields to become green again. Above: The procession of prayer. Left: The atrium of the cathedral awash with the torrential rain that fell at the precise moment when the procession returned to the cathedral. SEPTEMBER 10. MEETING WITH THE PRESBYTERY IN LIMA. 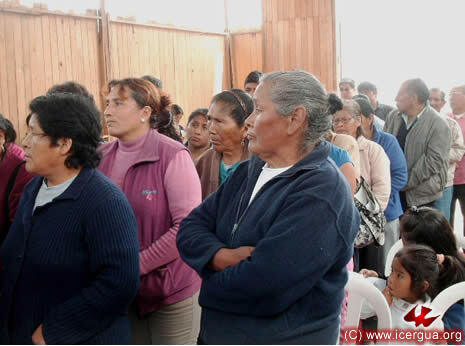 Our bishop made a pastoral visit to some of the communities that form the Mission of Peru. Greeting him before dawn at the airport are Mons. 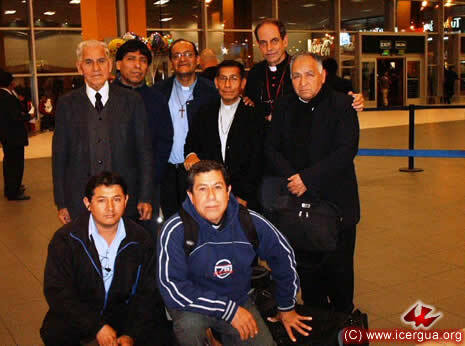 Jorge Isla, Father Gerardo Sotomayor, Father Juan Ernesto Iriarte, Deacon Victor and other brothers who take part in the Mission. During the morning of September 10, a long meeting with the Presbytery of Lima was held to exchange ideas and projects. Right: The bishop’s arrival at the Lima International Airport. SEPTEMBER 10. MEETING WITH THE COMMUNITY COUNCIL OF SANTA ROSA DE VALLE GRANDE, LIMA. On the tenth the bishop had a meeting with the directors of the Low-Income Housing Settlement of Santa Rosa de Valle Grande in Vitarte . 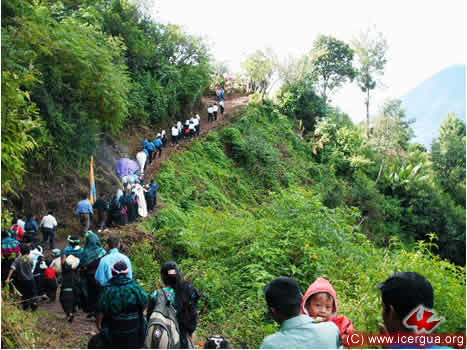 Father Juan Ernesto Iriarte works actively with these communities, both pastorally and educationally. Above and right: The meeting with members of the Committee for the Low-Income Housing Settlement and some children of the community. SEPTEMBER 11. 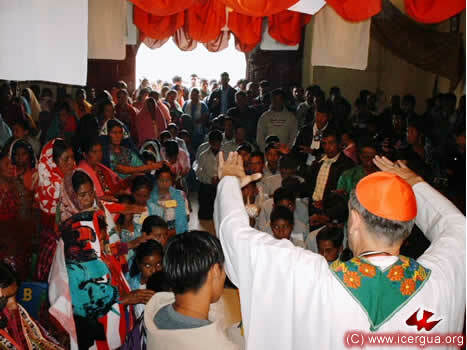 PERU: MEETING AND CELEBRATION IN HUANCAYO. 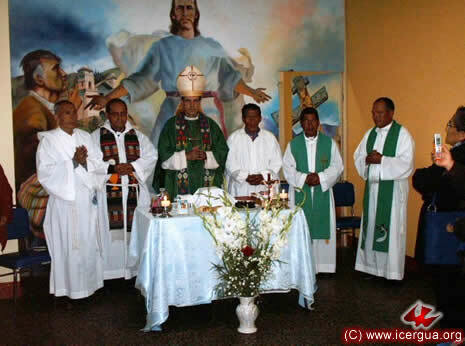 On September 11, accompanied by Father Juan Ernesto, the bishop met with some of the priests of Huancayo, with whom, after an extensive dialogue, he celebrated the Eucharist. Under the coordination of Father Lucio and Deacon Luís, firm steps are being taken to form genuine Renewed Catholic communities in that area. SEPTEMBER 12. 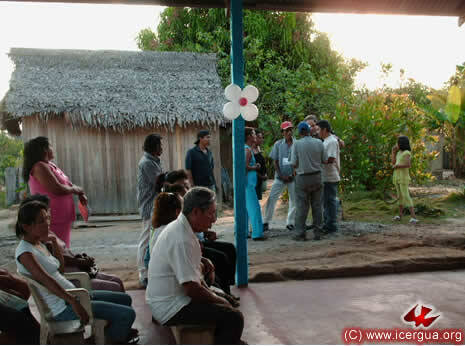 PERU: VISIT TO THE COMMUNITIES OF PUCALLPA, AMAZONÍA. 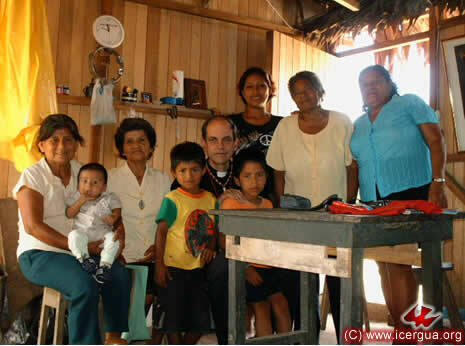 On the twelfth, the visit was to the mission of Pucallpa in the Peruvian Amazon region. The communities are tended by Father Miguel, who is generously giving his energies to consolidate authentic Renewed Catholic communities. Above: Some of the members of the community. The photograph was taken in the interior of the little house where Father Miguel lives. Left: Preparations for the celebration of Eucharist. In the back is Father Miguel’s little house. In the foreground is the church that is under construction. Right: Entrance for the celebration of the Eucharist. 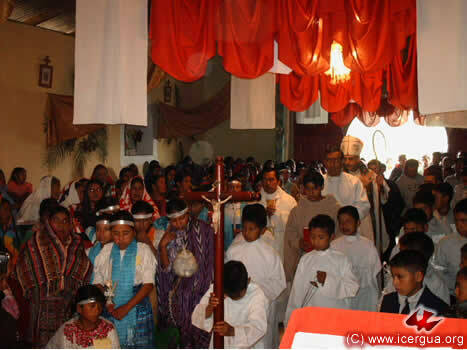 During the celebration confirmations were administered and baptisms of the young carried out. With great effort and the help of the community, Father Miguel has succeeded in putting up the floor and roof of the church. With the support of local authorities, enclosing the sides will now proceed. 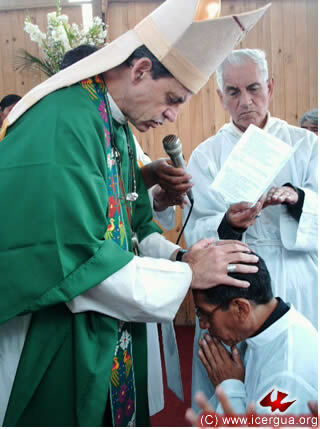 Although for several years Father Miguel has been working in this region, after investigating the regularity of the ordination that he received, those responsible for coordinating the Peru mission came to the conclusion that there were some fundamental doubts that warranted a deaconal and sacerdotal ordination “ad cautelam” —as a cautionary measure. In the photograph at the left: the rite of ordination which was celebrated in the context of the Eucharist and in the presence of the people of God who were present. SEPTEMBER 13. PERU: CELEBRATION IN THE SANTA CLARA, LIMA, REGION. 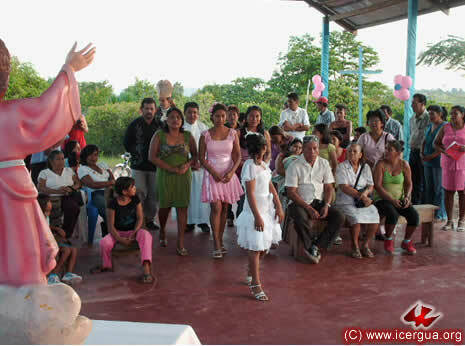 On Sunday the thirteenth the first celebration took place in an urban neighborhood in the Santa Clara, Vitarte, region. It has been served with zeal and generosity by Deacon Victor. In the photograph at the right: some of the participants presenting the offering in the exercise of their baptismal priesthood. Near the end of the morning, Eucharist was celebrated in the Low-Income Settlement of Santa Clara, with a large turnout of the faithful. 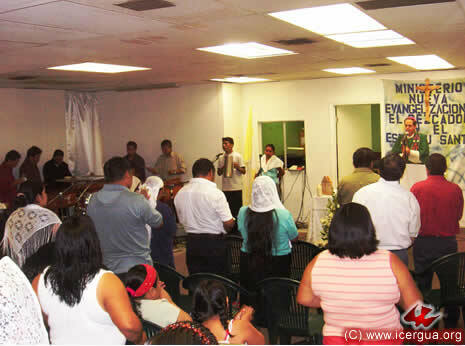 The community of Santa Clara has also been served for several years by Deacon Victor. 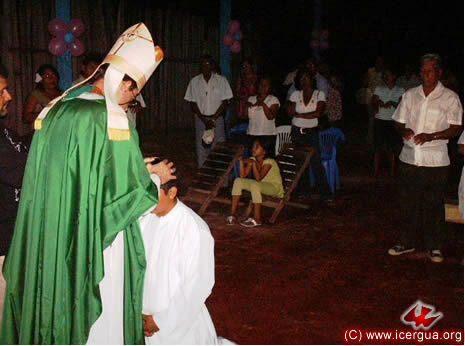 Since there were also some irregularities with respect to his ordination, he too was ordained as deacon “ad cautelam” in the context of the solemn liturgy, celebrated with a large part of the community participating. The sacrament of Holy Chrism was conferred on one of the brothers of the Santa Clara Community who has committed himself fervently to the life and mission of the community. Left: The laying on of hands and the prayer that the Holy Spirit be poured into the man being anointed. SEPTEMBER 13. PERU: CELEBRATION IN VITARTE, LIMA. Also on Sunday the thirteenth a visit was paid after lunch to a community of Vitarte, which is led by Brother Florentino. He was installed as minister of communion during our bishop’s previous visit. The ceremony was well prepared. 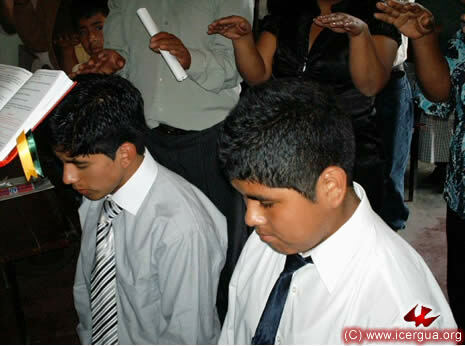 During it, baptisms and confirmations of some young people were celebrated. Left: Some of the participants at the Vitarte Community’s ceremony. SEPTEMBER 13. PERU: CELEBRATION IN FLORIDA, LIMA. 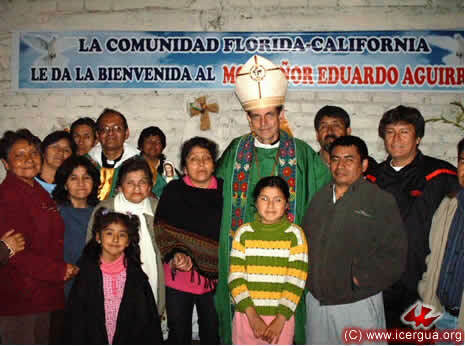 The pastoral visit to Peru culminated with a visit to the Florida-California Community, in the region of Vitarte. Left: Some of the members of the community, following the celebration. SEPTEMBER 18. LOS ANGELES: VISIT TO THE PACTO DIVINO COMMUNITY. On the eighteenth of September our bishop celebrated Eucharist in Los Angeles, California, with the brothers and sisters of the Pacto Divino Community. 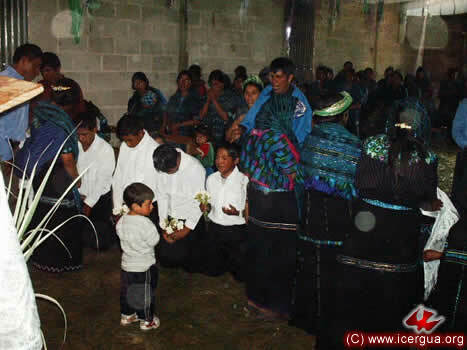 On that day, the members of the community confirmed their alliance with ICERGUA and prepared for the administration of several sacraments to take place during the next visit, which will on the seventeenth and eighteenth of October. SEPTEMBER 19-20. 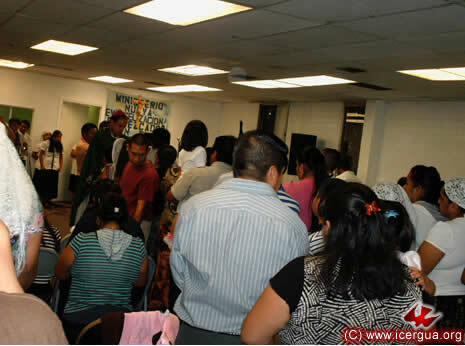 LOS ANGELES: EUCHARIST AND RETREAT FOR MARRIED COUPLES IN THE EL PESCADOR. On Saturday the nineteenth our bishop presided at the Eucharist during the Assembly of the El Pescador Community, Los Angeles, California. Afterwards, on the twentieth, he led a retreat especially for couples. On both occasions there were many people participating. The community is experiencing remarkable growth and maturation. Now it is preparing the next visit, during which the brothers and sisters will receive various sacraments that have been lacking for a long time. Above: The Reconcilation during the Saturday celebration. Right: Prayer during the Eucharistic celebration at the close of the couples retreat. SEPTEMBER 24. ARRIVAL OF FATHER ROSENDO RIQUELME. September 24 was blessed with the arrival of Father Rosendo Riquelme, a Chilean. He comes with the purpose of getting to know our church, collaborate with our communities and, if it is the will of God, to join us and exercise his ministry in our communities. 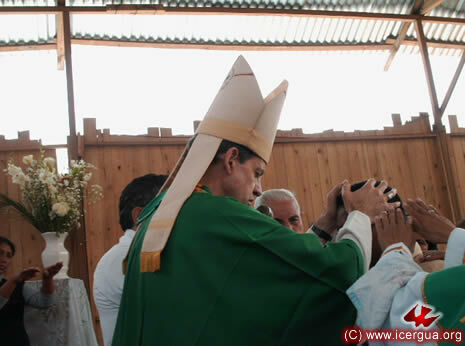 Left: Father Rosendo next to the bishop during one of the ceremonies celebrated on Sunday, the twenty-seventh. SEPTEMBER 24. 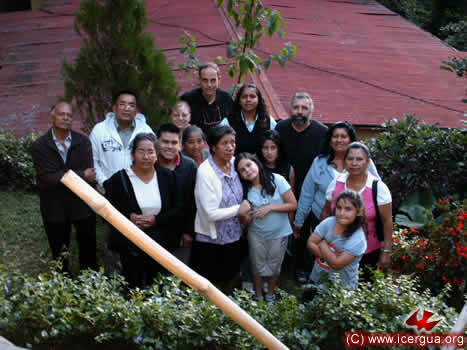 MEETING WITH BROTHERS AND SISTERS OF SANTA CRUZ BALANYÁ, CHIMALTENANGO. In order to learn about ICERGUA and to explore the possibility of joining our Church, the coordinating team of a large community from Santa Cruz Balanyá, Chimaltenango, visited Monsignor Eduardo on September 24. After the visit, the team consulted with other members of the community and decided to make an alliance with us and join our church. 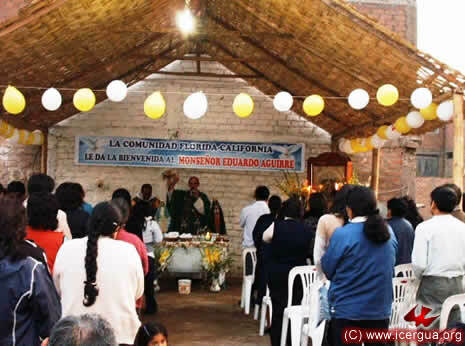 On Sunday, October 25, one of the presbyters that serve Comalapa will celebrate the Eucharist for the first time and begin to lay the foundation for ensuring the growth of the community and its fidelity to the Catholic faith. SEPTEMBER 24. GROWTH OF THE COMMUNITY OF LOS OLIVOS, ZONE 18, GUATEMALA CITY. A couple months ago, a small group of the faithful from Los Olivos, zone 18 of the capital, came to Father Herberth Urrutia to ask him to administer the sacraments to them. He went, explained to them who we are and what the meaning of our mission is. For them, what Father Herberth said was the answer to years of prayer and seeking discernment. In spite of intimidation, threats and harassment from other religious groups, these brothers and sisters have held firm and deepened their identity and sense of belonging to ICERGUA. 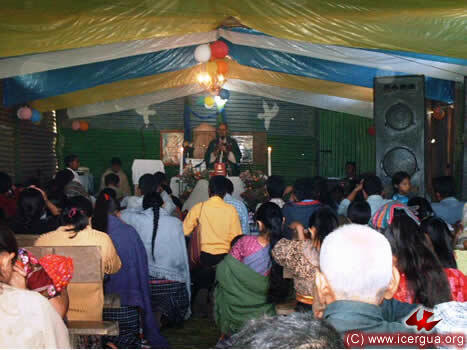 At present the community consists of several hundred faithful. Its growth has been at a full gallop! 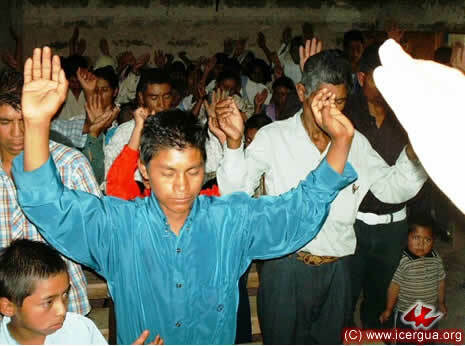 Once again the experience of the first Christians is repeated; persecution, threats and many other negative events have not stopped the work of the Lord and the growth of his church, but on the contrary have been the occasion of strengthening the brothers and sisters in their witness to the faith. SEPTEMBER 26. 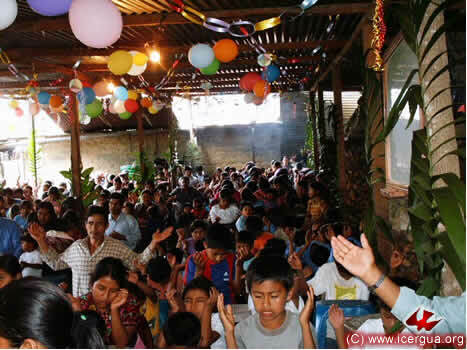 ANNIVERSARY OF THE COMMUNITY OF CHUITZANCHAJ, SOLOLÁ. On Saturday, September 26, our bishop presided at the celebration of the anniversary of the arrival of the Most Holy Sacrament at the Community of Chitzanchaj, Santa Cruz La Laguna, Sololá. A solemn procession with the Most Holy Sacrament went from the center of the community to the house of prayer. All the preparation, spiritually and organizationally, was excellent. The intensity of the young people who received the sacraments was palpable. Above: The procession of the Most Holy Sacrament, which began in the center of the community and reached to the Renewed Catholic Church building. Left: Some of the brothers at prayer as they receive the Sacrament of Confirmation. Transformed by the outpouring of the Holy Spirit, the brothers plunged into deep prayer, which extended almost to the end of the Eucharist. SEPTEMBER 26. 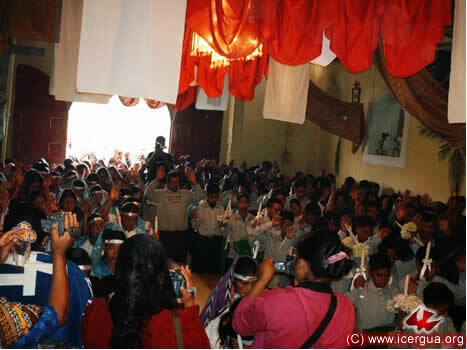 EUCHARIST IN XOLBÉ, SOLOLÁ. 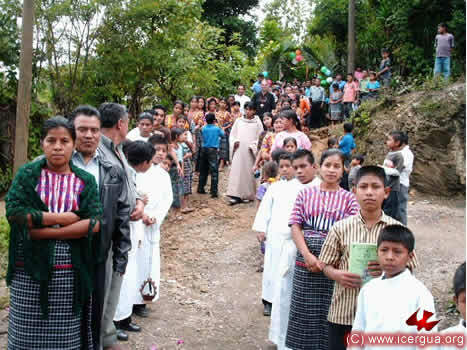 On the afternoon of Saturday, the twenty-sixth, the bishop visited the Community of Xolbé in the municipality of Sololá. The celebration centered on the baptism of the son of one of the many couples that make up the community. Right: The presentation of light. Made of the light of the land and salt of the world, the little one just baptized will now have to grow with the help of the witness of his parents and sponsors, so that the seed that was planted in his heart can grow and bear abundant fruit. SEPTEMBER 27. 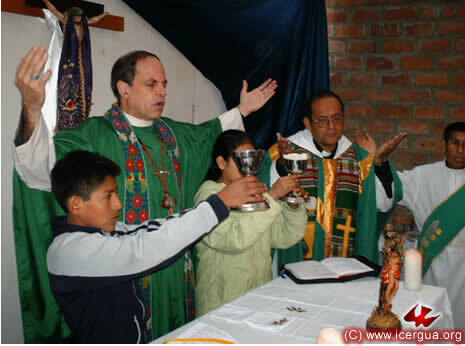 MASS IN LOS PIRIRES, SAN JUAN SACATEPÉQUEZ. 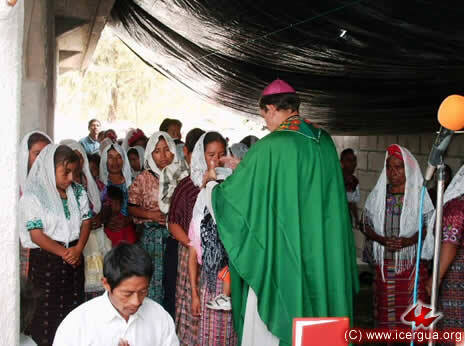 On the morning of Sunday, the twenty-seventh, the bishop made his first visit to the Community of Los Pirires in San Juan Sacatepéquez, Guatemala. The community has just made its alliance with ICERGUA, and already it is growing rapidly. It has built a temporary place of worship, and beginning with the visit of the twenty-seventh, the Most Holy Sacrament is permanently installed for the deepening of the people of God as they adore it. Right: During the ceremony two brothers, elected by the community, were installed as communion ministers. At the right of the bishop is seminarian Byron Santos Subuyuj, who is responsible for education in the Community of Los Guates. SEPTEMBER 27: EUCHARIST IN LOS GUATES, SAN JUAN SACATEPÉQUEZ. On the same day toward noon, our bishop visited the Community of Los Guates, San Juan Sacatepéquez. Every moment was carefully prepared. Seminarian Higinio Osorio coordinates the pastoral work in this community. He, along with José Rax, has succeeded in involving all the faithful in a serious process of involving the participation of every member of the community. 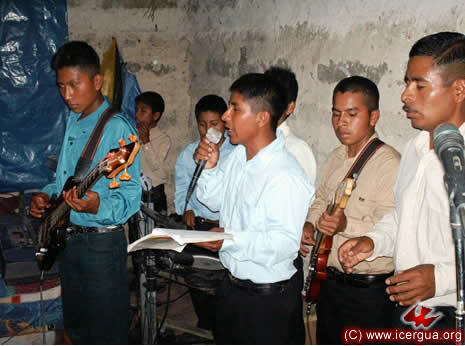 There is a large group of acolytes, and the young people’s group is especially strong and well organized. Right: During the Eucharist the different groups took their special places in the Assembly. In the photograph, the young women are deep in prayer during the confession of sin. Left: The children also had a place of privilege. There are eighty-five children who are preparing for their first communion, which will be November 22. In the photograph, the children are deep in prayer. Right: “Thanks to our Bishop, Monsignor Eduardo, for rescuing us from the slavery of 2005-2008” was the center of the message written in a beautiful tapestry that was presented by Brother Calixto at the end of the Eucharist. 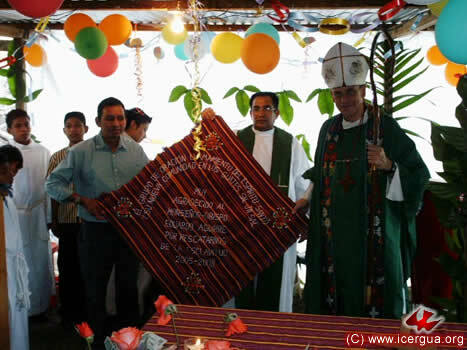 In the photograph the tapestry is being held by Father Rosendo and Brother Calixto along with the bishop. SEPTEMBER 29. 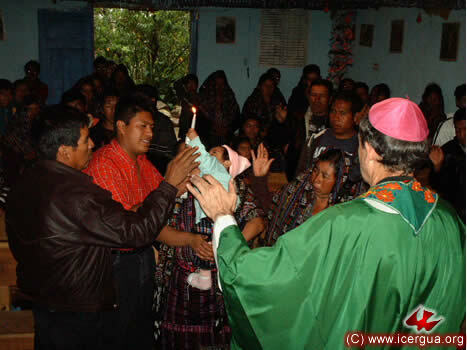 ESTABLISHING THE PARISH OF SAN MIGUEL, TZANIXNAM, TOTONICAPÁN. 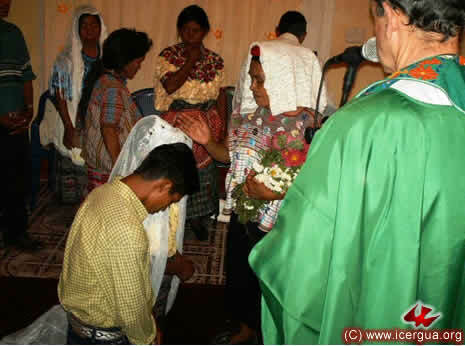 On Tuesday, Spetember 29, the decree creating the Renewed Catholic Parish of San Miguel the Archangel, Tzanixnam, Totonicapán. For more than a year it has been functioning as though it were a parish, and on the occasion of the patron’s day festival, the pastoral, finance and mission councils requested the bishop to formalize its status as a parish by promulgating the decree. 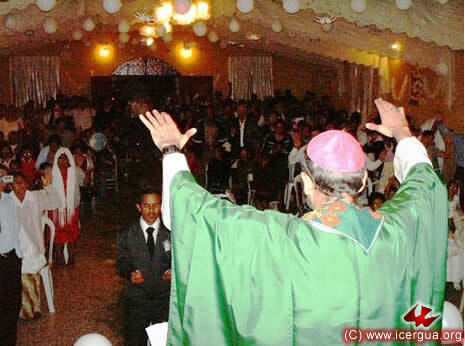 In the photograph at left: the bishop reading the decree and showing it to the People of God. SEPTEMBER 29. EUCHARIST IN THE PARISH OF SAN MIGUEL, TZANIXNAM, TOTONICAPÁN. During the Eucharist the chrismation of 44 young people was carried out. All had been carefully prepared, and the ceremony was conducted with deep care and devotion. Right: The entrance procession. Father Freddy Gonzáles and his co-worker Deacon Gildardo Ramírez have pastoral responsibility for the new parish. Left: The community at prayer when, after the confession of sins, the outpouring of the Holy Spirit is invoked in order to obtain sacramental pardon. Right: After the confirmation, the parents and sponsors of those who have been confirmed, along with the bishop, pray that the outpouring of the Holy Spirit, received through the sacrament, may bring forth the same fruits that were produced after the first Pentecost. SEPTEMBER 29. MEETING WITH THE LEADERS OF THE ANAWIM COMMUNITY. On the afternoon of September 29, the coordinating team of the Anawim Community, zone 18 of Guatemala City, visited the bishop to reaffirm its identity of belonging to ICERGUA and to renew its commitment to evangelism. 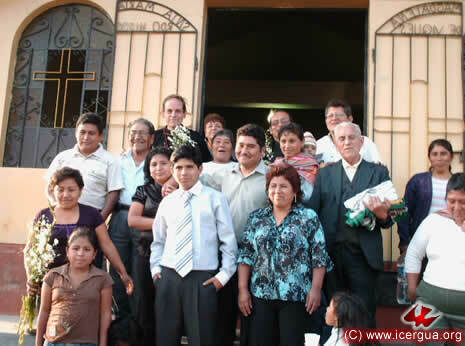 In the photograph at left, the directors are accompanied by other faithful members with the bishop after the meeting, which took place in the Seminary in San Lucas Sacatepéquez. SEPTEMBER 30. THE ESTYMLA PROJECT. The four seminarians who have worked very hard this year in ESTYMLA (School for Theology and Ministerial Training for the People of God) are in this photograph. 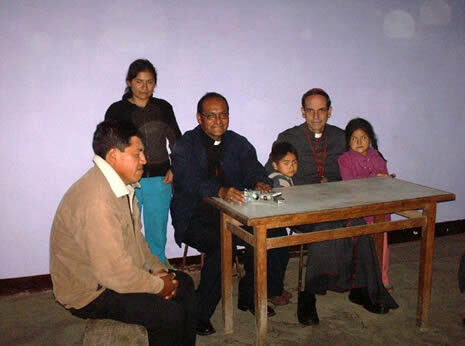 From left to right: Marco Tulio Calderón, Rev. 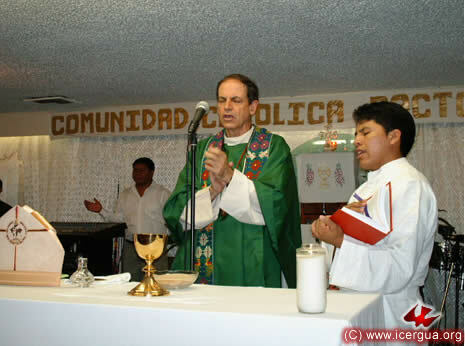 Deacon Juan Moisés Mendoza, Pedro Martínez and José Armando Herández. 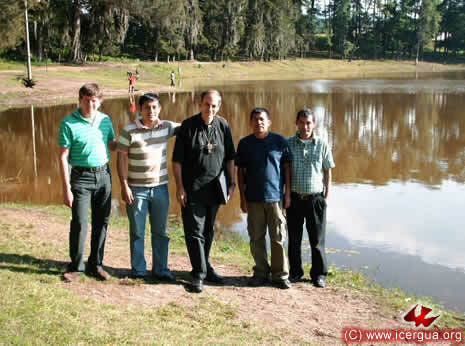 They are with the bishop at Lake Lemoa of El Quiché, en route from the Seminary to the Education Center in Huehuetenango.